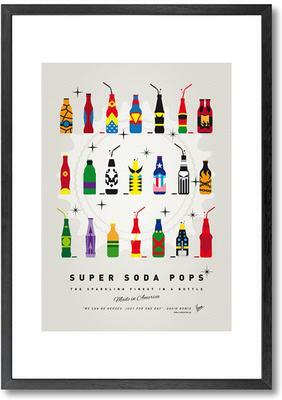 The My Super Soda Pops Universe Framed Print is a fun way of adding a colourful touch to your living space. Created by Chungkong, the print features a various soda pops wearing the look of various superhero characters including Batman, Superman, Ghost Rider and more. It's not exactly everyday you get your favourite superhero depicted as a fizzy pop. The print is framed under white matting and then placed in a wooden frame with shatter proof perspex. You can hang this inside your living room, bedroom or even give it away as a gift to a friend or family member. It's a fun way to add quirky drama to your walls.